This compact has a dark blue background with a gold design. 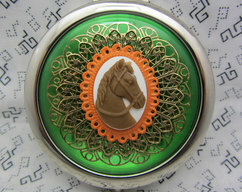 I applied an antiqued silver brass filigree and embellished it with a resin black horse cameo. I use a very strong glue so they won't come apart. 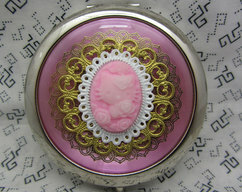 My compact mirrors make wonderful gifts for any occasion. Why not give them to your bridesmaids and maid of honor, mothers of the bride and groom and the hostess. Maybe you need a gift for a birthday, mothers day, valentines day, Christmas or how about giving yourself a gift. We all need to treat ourselves once in awhile. There are 2 mirrors inside, 1 regular mirror and the other is magnified. The compact measures approximately 3 inches in diameter. All compact mirrors will come to you in a gift box. Also included is a pouch to protect your mirror. Pouches will be a random pick. The picture of the pouches are just an example of what you will receive. You may not receive the ones pictured. I have many other patterns, there are too many to list. 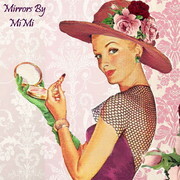 Your mirror will arrive to you already for gift giving.